Preheat oven to 400. Spray or grease a 8x8 baking dish. 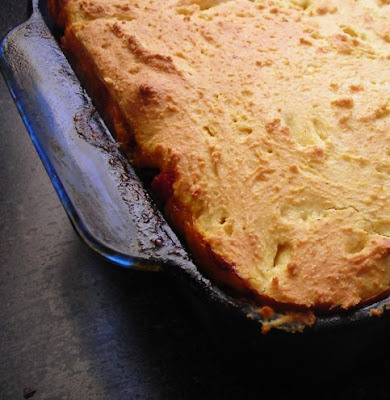 For the cornbread layer: In a medium bowl, whisk together cornmeal, flour, baking powder, baking soda and salt. Beat in the egg, buttermilk and oil until well combined. Set aside. In a large skillet, heat the oil in the pan, then saute onion, garlic until fragrant. Add chicken, cayenne and chipotle pepper powder, chile powder and sauté until the chicken is cooked through. Stir in beans, tomatoes with green chiles, olives, and peppers and the chipotle peppers and adobo sauce. Cook about 5 minutes or until the entire mixture is cooked though and the majority of the liquid has evaporated. Spread evenly into the prepared dish. The mixture should fill the majority of the pan, but don't worry, the batter will fit. Spoon the batter evenly over the chicken mixture to cover completely. Smooth with the back of a spoon or spatula. Bake 20-25 minutes or until the crust is golden brown. Let stand 5 minutes before serving. Slice into squares and serve. *Or 18 oz canned diced tomatoes and 4 oz canned chopped green chiles. 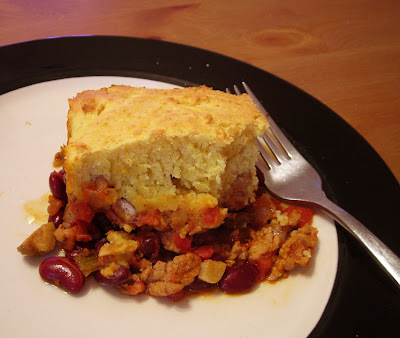 Tamale pie is a bit of a misnomer, it doesn't really taste like tamales beyond the most basic corn-meat level but is a dish all of its own. Tamale pie appears to date back to at least 1905 when it appeared in this Los Angeles Times cookbook. During WWI a vegetarian version was popular (probably due to wartime rationing) then tamale pie had a resurgence of popularity during WWII when meat rationing was again in effect as tamale pie can serve a whole family with a minimal amount of relatively cheap meat. For this recipe, I modernized it a bit, I swapped out ground beef for flavor absorbing ground chicken, added chipotle peppers for a smoky spicy flavor and upped the amount of tomatoes. Some recipes call for corn in the meat mixture, but corn isn't in season so I left it out. I don't think it would be entirely out of place and might even make this dish more of a complete meal.